The UK & Europe's number one Air Hockey Table. This is no toy, but the real McCoy. The table insisted upon by major bowling and leisure companies across the country. The Fast Track has time and again proved the players choice. Accessible to even the youngest players, the Fast Track's stunning cabinet design and mirror steel playfield outshine all others. The fastest game around with the liveliest score commentary and sharpest puck rebound. The Fast Track's precision engineered top rail delivers the loudest 'ping' for the most zing but angles the puck for a safer game. An added safety screen protects even the most enthusiastic players. Variable speed pucks deliver slower games for the very young and shorter legs can also be specified. 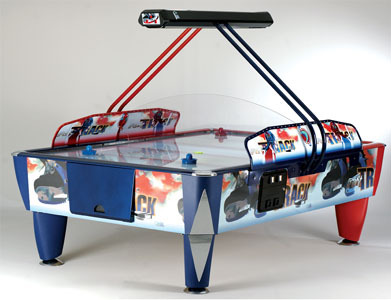 The top of the range commercial Air Hockey table that will prove a hit with every member of the family, and their friends! All SAM air hockeys are now available with a central bumper that really keeps players guessing and further speeds the game.